Bird, Roy. The Irish Arrive in Kansas. Kanhistique. 5 (March 1980): 1 and 3. (Oversize/K/978.105/K13/v.5/no. 11). Bush, Maynie S. "Irish." The Frankfort Story. Frankfort, KS: Frankfort Centennial Committee, 1967. (K/978.1/-M35/F853/pp. 139-143). Butler, Thomas A. 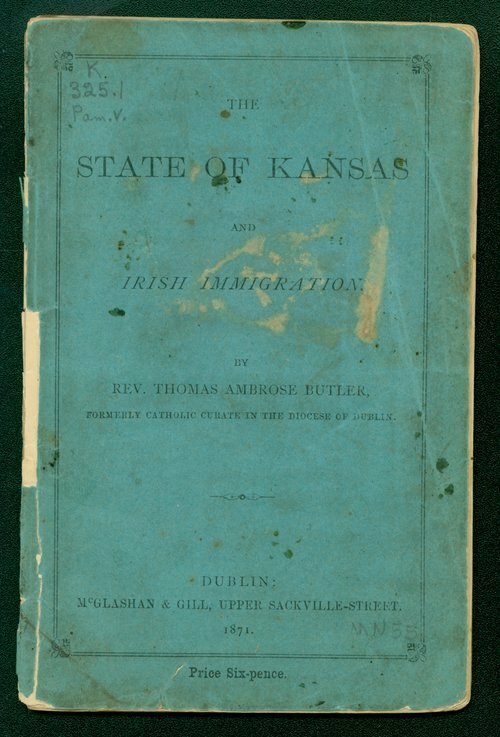 The State of Kansas and Irish Immigration. Dublin, Ireland: Dublin, McGlashan and Gill, 1871. (K/325.1/Pam.v.1). Forter, Emma E. "The Irish in Marshall County." History of Marshall County, Kansas. Indianapolis, IN: B.F. Bowen Co., 1917. (K/978.1/-M35/F77). "Into Old History: Dedicates a Feature to Early Irish Settlers of Solomon Community." Salina Journal. July 18, 1933. [1 p.]. (Reel: S 303). Madden, John. "The Irish Colony in Marion County." Florence Bulletin. Oct. 11, 1934. [1 p.]. (Reel: NP 4303). __________. "A Lost Colony." Marion Review. Sept. 26, 1934. [2 pp.]. (Location: 34-04-01-02). O'Neill, Pat. From the Bottom Up: The Story of the Irish in Kansas City. Kansas City, MO: Pants Publisher, 2000. (K/917.78/On2). Owen, J.S. 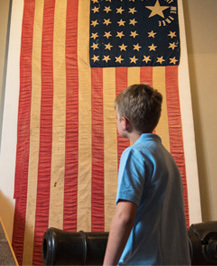 "Irish Came to Kansas Not in Colonies But in Families." Topeka State Journal. Mar. 18, 1939. [1 p.]. (Reel: T 1593). Patrick, Nikki. "Irish Had Role in the Growth of Southeast Kansas." Pittsburg Morning Sun. Mar. 13, 1982. [2 pp.]. (Reel: P 1500). Redmond, Bernard P. "History of Coal Creek: Its Irish Pioneers. Seneca Courier-Tribune. Apr. 14, 21 and 28, May 5, 12 and 29, June 2, 12, 16 and 19, and July 3 and 7, 1941. [13 pp.]. (Reel: S 891). Rupp, Jane C. "Irish Settlement in Clark Township." Marion County Scrapbook. (Vol. 1). N.p. : Author, 1927. (K/978.1/-M34/R87/p. 45). Taylor, Loren L. "A Short Ethnic History of the Irish People in Wyandotte County." 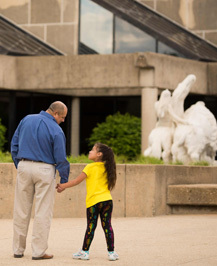 A Short Ethnic History of Wyandotte County. Kansas City, KS: Kansas City Kansas Ethnic Council, 1982. (K/978.1/-W97/K133s). Waldron, Nell B. "Colonization in Kansas from 1861 to 1890." Doctorate dissertation, Northwest University, Evanston, 1923. (K/325.1/W147/c. 2/pp. 40-120).